Denver (14-2). Every time you look at a bad team you look for strengths and each time you look at a good team you will look for weaknesses. With that in mind, the Broncos are down a top wide receiver and top running back. Emmanuel Sanders comes over from the Steelers and will be a nice complement to Demauryius and Julius Thomas as well as Wes Welker. The Bronco defense might be their best up front where a defensive line is both deep and talented. While Denver adding an aging DeMarcus Ware to the mix, they didn’t really address the need for a second (or first) cornerback. Susceptibility to passes over the top might be the biggest weakness in their game plan. 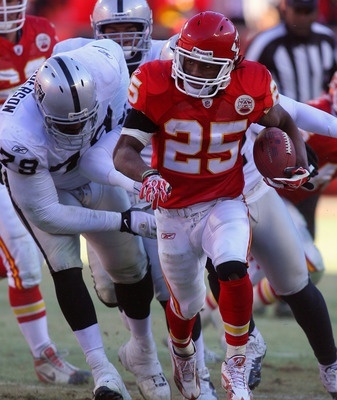 Jamaal Charles needs to carry the Kansas City offense once again to make them successful. Kansas City (9-7). Alex Smith was both efficient and productive last year. That might sound a bit redundant, but most QBs that are described efficient generally don’t turn the ball over and facilitate a solid running game. But in the current passing league that the NFL has become there is no choice but to make some things happen. And Smith did. So did Jamaal Charles, who came back from a devastating injury the year before to provide one of the better seasons in recent memory at his position. Still, there are no real receiving threats and Dwayne Bowe is a step slower than past years where he might show up for a game or two and dominate. While losing their left tackle doesn’t help much, two very versatile backs (Knile Davis and De’Anthony Thomas) will really help with the dearth of talent at the receiver position and the loss of Dexter McCluster. A very good defense returns with perhaps the best group of linebackers in the league. If there’s a weakness for this D, it’s in the secondary where the cornerbacks were struggled even before Brandon Carr got released. If the Chargers are going to continue their upward trend, they need Ryan Mathews to play consistently and not get hurt. San Diego (8-8). Like him or not, Philip Rivers gets the job done. 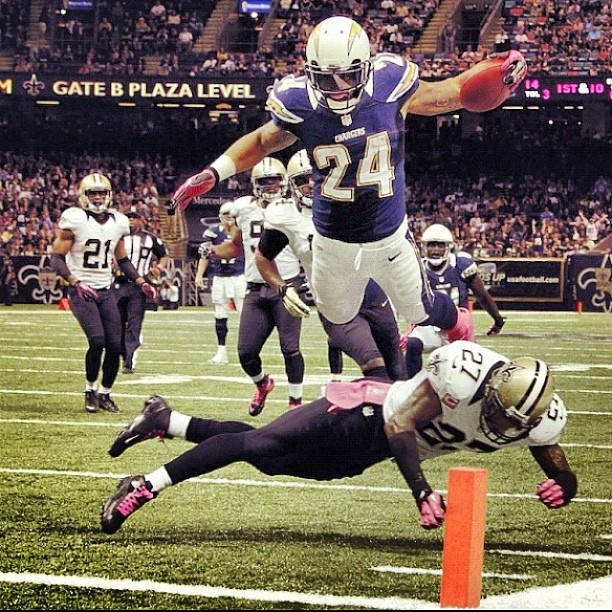 He might not have the prettiest delivery, but Rivers continues to churn out 4000-yard seasons with very little support. Ryan Mathews surprised some last year and stayed healthy enough to produce a good stat line, but that probably won’t happen again. Still, Keenan Allen was an impressive rookie and Malcolm Floyd can be a game-changer when he decides to come to play (not that often). The interesting story this year may be who emerges as the most used at tight end. Ladarius Green is very close to overtaking long-time starter Antonio Gates. On the other side of the ball, Jarrett Johnson was bad last year. He came from a defense where all he was asked to do was set the edge, unfortunately there’s other things needed on the football field. Here’s hoping he gets them done. If the Bolts can create a pass-rush the defense might be a lot better. The secondary is already shaping up to be much improved from last year. Oakland (6-10). Adding so many big names (or at least former big names) and veterans looks great on paper. But will it work for the Raiders this season? Matt Schaub is certainly an upgrade at quarterback, even though I’m sad to see Terrelle Pryor not get a full season (if healthy) to see what he can do. It’s not like it’s going to get any worse for them. Darren McFadden has been an exceedingly frustrating player for both fantasy and real-life football. It looks like the front office couldn’t wait any longer for him to put it together and so they went out and got Maurice Jones-Drew. MJD is past his prime, but still better than anyone else they have. There’s no one for Schaub to throw the ball to. James Jones and Greg Little are hardly big offseason acquisitions. Khalil Mack should be a fine player in the NFL, but that won’t matter much this season. He will definitely have the chance for 200 tackles though. Justin Tuck and LaMarr Woodley would only have been solid pickups had this been 5 years ago and they basically just decided to steal the 49ers spring cleaning at the cornerback position.